Frank J. Ivanich, 99, of Munster passed away Saturday, September 8, 2018. He is survived by his loving children Mary Ann (Clifford) Herrell, Frank J. Ivanich Jr., Jacqueline (John) Haynes, Bernadette (late Joseph) Leitelt, beloved grandchildren ,Michele Cozine, Michael Herrell, Melissa Hansen, Mark Herrell, Mandi Herrell, Misty Herrell, Mary Haynes, Joseph Leitelt and eight great-grandchildren. He was preceded in death by his wife Mary, brother Rudy, parents Mathew and Mary, grandson Mathew Herrell and wife Rose..
Visitation will be Wednesday September 12, 2018 from 3:00pm to 8:00pm at Hillside Funeral Home and Cremation Center, 8941 Kleinman Road, Highland, IN 46322. A Funeral Mass will be celebrated Thursday September 13, 2018 at 10:00am at Our Lady of Grace Church-3025 Highway, Highland, IN 46322, Fr. Edward Moszur officiating. 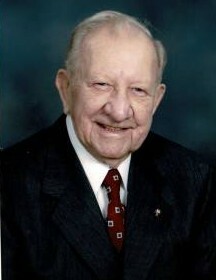 Frank was a member of Our Lady Grace Church, an Army WWII veteran, retired from Amoco Oil after 42 years, member of the American Legion Post 369 East Chicago, 4th Degree Knight of the Knights of Columbus Marquette Council of Griffith and was a Boy Scout leader at St. Ann's Parish of Black Oak. Frank enjoyed fishing, hunting, gardening and was an avid model boat maker. Memorials in his honor may be given to Hospice of the Calumet Area.